SMS and I headed to the West Coast (Best Coast!) of Japan this past weekend. I had to travel the next week to a couple of clinics so we decided to build on the trip. We each had a specific place we wanted to see on the West Coast. SMS wanted to see the famous Hotaru-Ika (Firefly squid) along the Toyama Bay coast. I really wanted to see Kanazawa after hearing rave reviews about it several years ago when Brady and Ed visited. There is also a really good "36 Hours in..." article on Kanazawa so I had a few places in mind. We left Friday afternoon and took the new Shinkansen to Toyama. 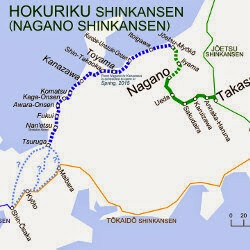 The new route extended the Nagano Shinkansen beyond Nagano all the way to Kanazawa. This extension connects Tokyo and Kanazawa directly so it takes only 2.5 hours! Before, the trip required a transfer at Kyoto or Nagoya and took a little over 5 hours. Anyway, we were very excited and took the Shin to Toyama, followed by a local JR train to Uozu. We had eaten on the train so we checked into the hotel, dropped off our bags and decided to walk to the beach. Interestingly, our hotel seemed to be in the Red Light district of Uozu since there were several clubs with prostitutes milling about outside. But it's Japan so it felt very safe. After one of the prostitutes unsuccessfully called after three guys, she called out a very friendly "Kombanwa" to SMS and I. Not exactly knowing what to do, I decided to be polite and say "Kombanwa!" back. Screen shot for Firefly Squid, apparently mostly for eating, not seeing! I ate a marinated one for breakfast and almost threw up. The two pictures on the bottom (center and right) are the most common (and really only) pics on the web, in both Japanese and English searches. This is a screen shot from a Google search. Anyway, we walked to the shore and found that there was very little beach. It was mostly a concrete barrier seawall and nary a firefly squid in sight! Boo hoo! We walked along but the picture that was so beautiful on the internet never materialized before our eyes. At the same time, I had low expectations because the picture, while spectacular, was really the only one found in the web searches. I feel that if it was common, there would be a lot more photos since there are so many photographers in Japan that would flock to a place like this. Submerged sugi roots- part of the museum is under the current sea level! The next day, we decided that we would max out our tourist experience in Uozu so we went to the drowned forest museum. When they built the harbor, they came across the submerged root structure of an ancient 2000 year old Japanese cedar (sugi) forest. Honestly, it sounds like they made lemons out of lemonade since it would probably be pretty annoying to come across a bunch of roots when trying to dredge a commercial port. So, they made it a tourist attraction! At the museum, we saw two short movies which showed off two of the three tourist draws of Toyama Bay. One is the Drowned Forest, and two is the Spring "mirage" where the interface of different thermal air gradients creates a shoreline mirage. The movies had beautiful cinematography and highlighted the beauty of the area, which was cool since we were there on a gray, foggy day. I look how the squid feels, I think! 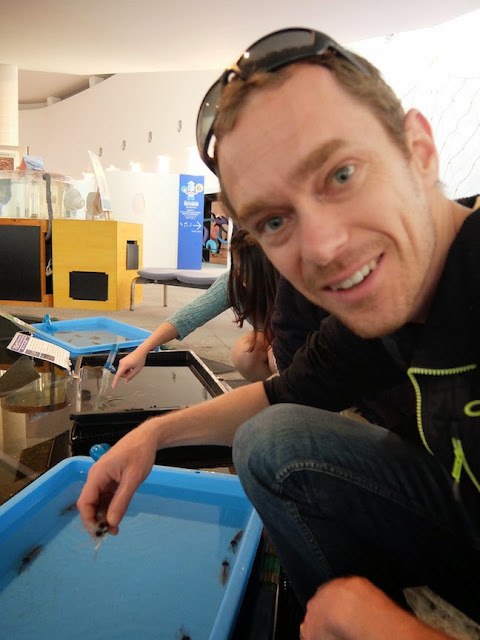 After the cedar forest, we travelled to Namerika to the Firefly Squid museum, the third attraction of Toyama Bay. We left our bags with a tourism board lady at the station (yay!) and walked straight out the railway station about 10 minutes down the road. The museum was pretty cool. The highlight was the Hotaru Ika show. We went into a small auditorium where, after a short movie, the lights went out and we shook a net holding very lethargic squid. In response to the stimulation, they glowed! We saw the luminescent Hotaru Ika! Hooray! Sign at the museum. Don't worry, SMS and I were in no danger of breaking this rule! By the way, in terms of experiencing the Hotaru Ika as gustatory delicacies, SMS and I were a little more successful. At the hotel breakfast, there were little plates of the squid marinated in a miso sauce. I tried one but it was way too early for that type of culinary Fear Factor. I wanted to spit it out but I persevered. The thing that got me is the body part has a lot of squishy stuff that, to me, also tasted a bit off. So between the texture and the taste, I was over it shortly after I began. At the firefly museum, we had Squid tempura rice bowls for lunch. I was sort of scarred and only ate the legs so my lunch was on the teeny side. SMS ate them and thought they were good but after those two meals, we felt we had been adventurous enough! Then, it was off to Kanazawa. We checked in and walked to the castle grounds. It was a beautiful night and the outer walls that remain are quite pretty. After sunset, we went to a restaurant in a pretty cool area. The food was good but it wasn't my favorite restaurant in Japan. Oh well, win some, lose some. Also, it definitely wasn't as bad as my restaurant choice in Nagano. 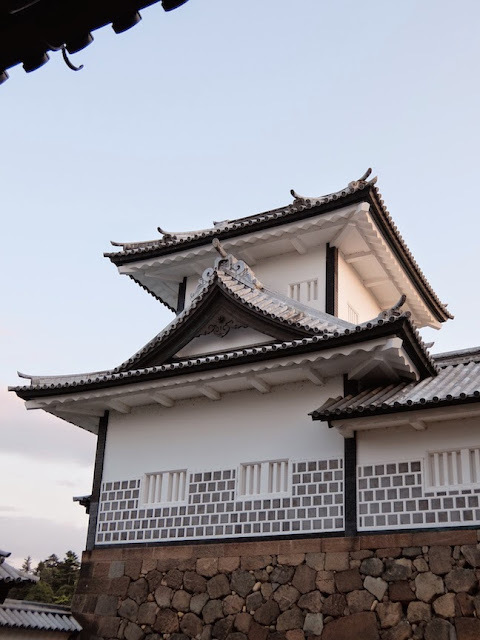 We went to bed for our exciting next day plans- the NINJA temple and the Kenkuen garden.